“Development of telecommunication industry is also important in North Korea as well as we face Industry 4.0.” said President Moon Jae-in of South Korea to Supreme Leader Kim Jong-un of North Korea at a South Korea-North Korea summit that took place on the 27th. Changes in paradigm from economic cooperation between South Korea and North Korea are expected as relationship between two countries starts to change. North Korea decided to use forgo North Korean time, which was 30 minutes apart from South Korean time, and use South Korean time since it changed its time 2 years and 8 months ago. Two countries also announced their plan to make closure of nuclear test sites in North Korea public sometime in May. They are going to make step-by-step process of ‘complete denuclearization’ by North Korea transparent to international societies. “Supreme Leader Kim Jong-un of North Korea declared publicly that it will change Pyeongyang Time in accordance with Seoul Time.” said Presidential Spokesman Yoon Young-chan at an additional briefing of the summit on the 29th. In the past, South Korea and North Korea used Japan’s Tokyo Time that is based on 135 degrees east longitude. However, North Korea created ‘Pyeongyang Time’, which is based on 127.5 degrees east longitude, on the 15th of August in 2015 as it celebrated 70th years of National Liberation Day while clearing remnants of Japanese colonialism. “Unification of standard time brings many difficulties and involves financial burden for North Korea.” said Presidential Spokesman Yoon Young-chan. 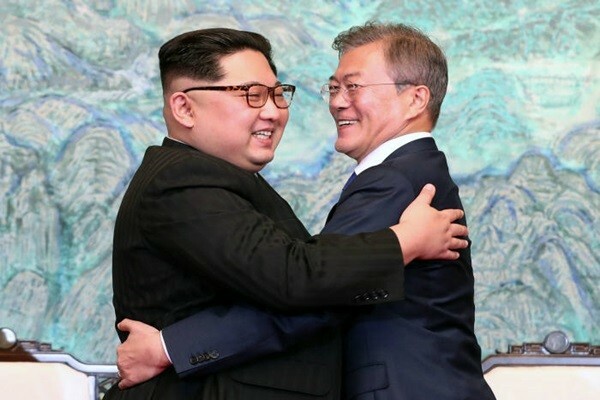 “Decision by Supreme Leader Kim indicates North Korea’s intention to harmonize with international societies and to eliminate any obstacle with the U.S. regarding exchanges.” Reporters were actually confused when two leaders were going over MDL (Military Demarcation Line) at the summit due to standard time. Although Supreme Leader did not respond to President Moon’s suggestion immediately, it is expected that two countries will work on establishing standards in respective telecommunication industries. South Korea has advanced network infrastructures. South Korea’s technologies and knowhow in telecommunication are needed for North Korea who is operating 3G telecommunication network. “Because North Korea is emphasizing on scientific technologies and information telecommunication as part of its economic development, it will be very active in working with South Korea in these areas.” said Professor Chung Young-cheol of Sogang University. According to The Blue House, Supreme Leader Kim also announced at this summit that it will carry out closure of its nuclear test sites in May. He also announced his plan to invite experts and reporters from South Korea and the U.S. to North Korea shortly to make closure of nuclear test sites transparent to international society. President Moon welcomed this idea from Supreme Leader Kim. Two leaders decided to discuss about schedules on invitation and others as soon as North Korea is ready. It is expected that this invitation will take place between end of May and beginning of June before a summit between the U.S. and North Korea takes place. “Fact that North Korea is making closure of nuclear test sites transparent to the world indicates its intention to actively participate in verification process of North Korea’s nuclear weapons that will be discussed in the future.” said Presidential Spokesman Yoon Young-chan. This measure by North Korea is expected to have positive impact on a summit between the U.S. and North Korea. Their eye levels can be lowered based on North Korea’s intent on denuclearization. It is expected that there will be a more detailed roadmap on how North Korea is going to go about denuclearization.